Syrians stand and look out on the street of the ancient city of Palmyra on 18 May, a day after ISIS took control of the city, which is home to a 2,000-year-old World Heritage Site. The sun sets on the ancient Syrian city of Palmyra. The city contains architecture of one of the most important cultural centers of the ancient world. Saturday, ISIS militants seized part of Palmyra. Read more about efforts to save some of the city’s statues here. In a country where poverty and public ignorance about HIV run deep, Sister Rosily and the other sisters are painfully aware they can only do so much. As a CNEWA donor, you can help them continue their good work. As the sisters spend each day doing all they can, they can use a helping hand from you. In this image from last month, thousands of Iraqis fled the city of Ramadi as fighting intensified. "There Are No More Jobs Anymore"
It has become a very familiar chorus of complaint in Lebanon. “There are no more jobs anymore. The Syrians took them all.” So before I started reporting on the story, I was aware of the impact of the Syrian refugee crisis on the job market and people’s morale in Lebanon. I knew that the poor classes in the country have been particularly suffering because of the crisis. But I did not know the extent of the problem until I spoke to families struggling on a daily basis to send their children to school and put food on their plates. I heard many heart-breaking stories of families receiving warnings from schools because they were not paying tuition fees and subsequently had to keep their children at home for days until they could pay. There were also many stories of families who could not afford their rent anymore and who were scared of losing homes they lived in for decades, in some cases. What touched me most was to see people keeping a very tidy and even elegant appearance knowing that in reality they were worried about sleeping hungry. These were people who were able to sustain themselves and even live rather comfortably few years ago but who are, today, increasingly uncertain of the future. I was particularly moved by the sad look of Tony, an impoverished contractor, who is anxious about the possibility of having to move his daughter from a private school to a public one. Children’s education is still the single most highly valued thing for Lebanese parents. Public schools in the country can be notoriously bad. So most parents pay a large part of their income to ensure that their children receive the best education possible at private institutions. I was also unsettled by Marlene’s story. She is a struggling nurse who went into debt to ensure that her daughter gets a good college education. Marlene keeps an elegant wardrobe despite her meager income. She told me that she hasn’t bought any new clothing items for a very long time. She said that her sister gives her some of her clothes after wearing them for a little while. I think the most challenging moment was asking people how they saw the future. Most of the time, they responded with blank looks as if they had been avoiding thinking about that. Most said they just lived one day at a time. Despite this bleak picture, many of those I interviewed seemed resilient. I was pleasantly surprised to find out that several said that they did not wish to leave the country despite their hardships. They said the thought that Christian minorities were being driven out of Syria and Iraq made them even more determined to stay in the land of their ancestors. 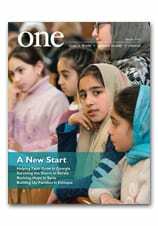 To learn more, read “Lebanon on the Brink” in the Spring 2015 edition of ONE. Traditional honey cakes, as well as souvenirs, are sold at an annual fair in Máriapócs, a little Greek Catholic village that is Hungary’s most beloved pilgrimage site, with a special devotion to Mary. To learn more, read “Hungarians Gather to Honor Mary” in the May 2005 edition of ONE. With sadness, I want to inform you of the passing of François Moniz, my colleague and dear friend, who died on 10 May at the age of 56 after a courageous battle with cancer. François was a founding staff member of CNEWA Canada, and acted as Office Manager. He was instrumental in the creation of our office in Ottawa, and truly helped to make a difference in the world. François showed unconditional support for the mission of CNEWA. We will remember him for his kindness, generosity and friendly smile. We give thanks to God for the blessing that François was in our lives. He will be truly missed by our staff in the Ottawa office, by his friends and most especially by his family — his wife Edith and two children. I invite you to pray for the repose of the soul and for his family. May François rest in peace. Palestinian President Mahmoud Abbas greets Pope Francis at the conclusion of the canonization Mass for four new saints in St. Peter’s Square at the Vatican on 17 May. Also pictured is Archbishop Georg Ganswein, prefect of the papal household. The pope canonized four 19th-century nuns. The new saints are: Marie-Alphonsine and Mary of Jesus Crucified, both from historic Palestine; Jeanne Emilie De Villeneuve from France; and Maria Cristina Brando from Italy.